When I see a spot on the Tennessee White Lightning Trail like Shady Grove Meadery I have to visit. You should too. It's not that they 'only' make the drink of kings and queens. The folks at the Shady Grove Meadery are also great people, sell local works of art and products and revive the ancient craft of making mead. 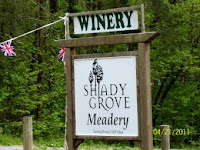 It was a warm spring day when Hubby and I stopped in at the Shady Grove Meadery. It's a quiet little place just off of the Tennessee Lake City exit on I-75. Turn left at the bottom of the exit ramp. Go about a half mile. You can't miss the White Lightning Trail sign in the front parking lot. There are plenty of parking spaces and the lot is shaded by several large trees. Here is what I found out about the Shady Grove Meadery. The term honeymoon comes from mead. Legend has it that giving a newly married couple of 'moon's supply' of the honey wine meant the couple would have a fruitful union. It was also thought to impart strength, intelligence and health. Today, it is popular for celebrations, Renaissance Fairs, individual consumption or any time you want a quality alcoholic beverage. Three different types of mead are available at the Shady Grove Meadery. These are the Sparkling Champagne Style that is good for weddings. The other types are Traditional Honey Meads and Traditional Fruit Meads. 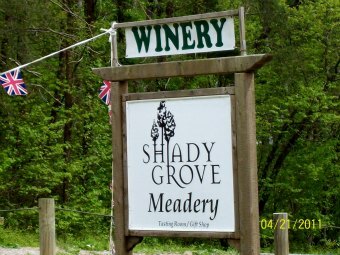 The Shady Grove Meadery offers tastings. Although medications kept me from the tasting Hubby was able to give it a go. Since we're planning our daughter's wedding, Hubby tried the Sparkling Champagne Style. According to him it has a light, pleasing taste that would be good for a celebration. That's good enough for me. Now I just have to wait for her final guest list to determine how much to buy. Stepping into the Shady Grove Meadery is interesting even if you don't drink alcohol. A small collection of local art and products are available. I picked up a jar of Orange Blossom Honey Jelly. It turns out to be made at Honeyberry Farm right here in Knoxville, TN. They aren't affiliated with the meadery but the product tastes terrific nonetheless. If you are headed that way be sure to stop in for a taste of mead. They are located at 709 Norris Freeway in Lake City, TN. 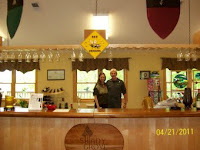 Find out about their hours and such online at www.shadygrovemead.com. When we left the Shady Grove Meadery we headed on over and took these shots of Norris Dam. The top spillways were open and visiting was indescribable. Together, both stops made for a fun way to spend an afternoon.